The Spritz is a festive cocktail perfect for year round sipping! Spritz Cocktail perfect for winter, spring, summer or fall! I have a confession. I’m not a huge fan of champagne. Maybe if I could afford the really good stuff, I would change my mind. What I have found though is that Prosecco makes a mighty fine substitute. A cheaper Prosecco fares much better than a cheaper champagne – or at least that’s my opinion. Prosecco is perfect for topping off cocktails! So, for New Year’s Eve we bought a bottle of Prosecco. We ended up having other cocktails through the night and didn’t feel like opening the bottle just for a midnight toast. Turns out that was a very good move on our part. What I found was the Prosecco works as a great topper for a lot of cocktails! Instead of topping with club soda, Prosecco adds a special touch. 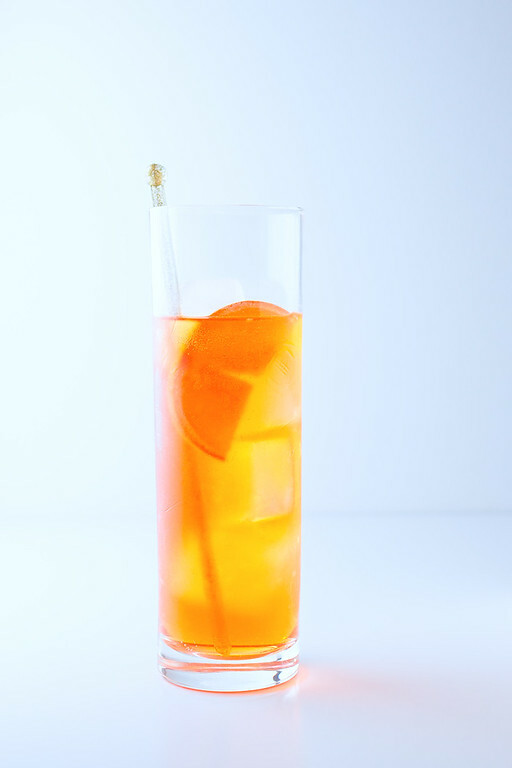 There are several versions of a Spritz Cocktail, this one is from Saveur Magazine. Combine the prosecco, aperol and soda water in a glass filled with ice. Garnish with an orange slice. Thanks to everyone that linked up last week. Remember I tweet, pin, and share on Facebook most of the links. I would love it if in return you linked to my page, you can also grab my button from the side bar! 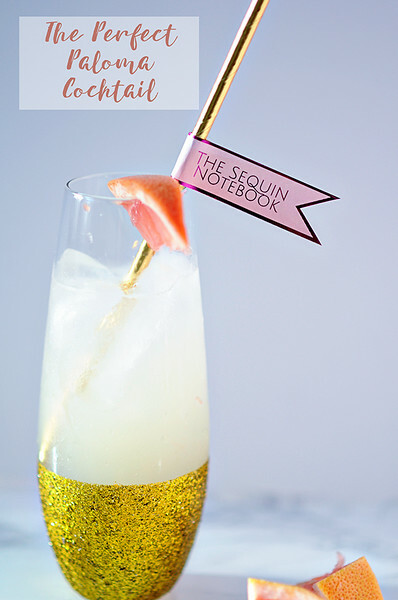 Last week’s most clicked link was: The Paloma Cocktail from The Sequined Notebook!! 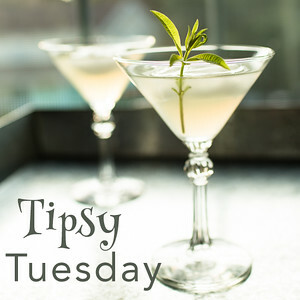 Please join me for Tipsy Tuesday. I completely agree with the prosecco over the champagne!! Maybe it’s because I can’t swing the good stuff, either. 😉 This looks great … but I don’t have aperol! I clearly need to get some. This looks gorgeous. I only recently “discovered” Prosecco myself. Never had Aperol (had to look it up!). This sure sounds good – adding to list of things I need to try! I love topping off with Prosecco too! This looks fantastic, Pam! I agree–Prosecco is a wonderful and inexpensive alternative to Champagne. After the New Year’s celebrations, this is a great time to buy it on sale too! Your featured drink is so pretty and refreshing looking! The truth is that both Prosecco from Italy and Cava from Spain can be as good or even better than their sparkling wine counterpart from France; it’s simply the only one that is allowed by law to be called champagne. It does have a nice ring to it and I might name some cocktails with the word champagne but in my mind the three are interchangeable. Except maybe in Italy where the Italians most likely demand Prosecco for their Aperol Spritz! This sounds so refreshing. I love a good cocktail. Our fizz of choice too, unless the champagne is £££££££ but that’s never 🙁 I love Spritz and think that alcoholic fizz beats club soda any day of the week. Your ratio pf prosecco to Aperol sounds perfect too. I only recently discovered this lovely cocktail at our local Italian restaurant. Now I have one every time I go there! Aperol Spritz is so refreshing – the one you have made looks beautiful, Pam! I agree, good Prosecco is a fantastic alternative to champagne (great when you are serving lots of people) and a wonderful cocktail ingredient. Yummed and shared. Thank you for being a part of the Hearth and Soul Hop. Looks delicious very nice drink, thanks for sharing with Hearth and soul blog hop.